In this tutorial, I’d like to share with you my 6 tips for blocking email spam with Postfix SMTP server. Over the last two years of running my own email server, I received a lot of spam, most of which came from China. Spam exists because it’s so cheap to send large volume of emails on the Internet. Postfix allows you to block spam before they get into your mailbox, so you can save bandwidth and disk space. This post is the result of my experience in fighting spam. Note: If you plan to run your own mail server, I recommend using iRedmail, which really simplifies the process of setting up a mail server. It also ships with anti-spam rules. If you prefer to set up a mail server from scratch, then check out my mail server tutorial series. Below is what I found about email spam. These spam are easy to block. Their IP addresses don’t have PTR records. The spammer doesn’t provide valid hostname in HELO/EHLO clause. They spoof MAIL FROM address. They generally don’t re-send email after a failed email delivery. Legitimate email servers should never have these characteristics. So here comes my 6 tips, which will block 90% of spam. For example, the following command returns the hostname of Google’s mail server. 172.217.85.209.in-addr.arpa domain name pointer mail-ua0-f172.google.com. Due to the prevalence of spam, many mail servers require that SMTP clients have valid PTR records associated with their IP addresses. Every mail server admin should set PTR record for their SMTP servers. If the SMTP client has a PTR record, you can find a line in Postfix log like below. If the SMTP client doesn’t have a PTR record, then the hostname will be identified as unknown. To filter out emails with no PTR records, open Postfix main configuration file. Add the following line in smtpd_sender_restrictions. This directive rejects an email if the client IP address has no PTR record. Save and close the file. Then restart Postfix for the change to take effect. As you can see, the HELO hostname is ip-172-30-0-149.ec2.internal , which is only valid in AWS internal network. It has no valid A record nor MX record. To enable HELO/EHLO hostname restriction, edit Postfix main configuration file. Use the following line to reject non fully qualified HELO/EHLO hostname. Save and close the file. Then reload Postfix. A legitimate email server should also have a valid A record for its hostname. The IP address returned from A record should match the IP address of email server. To filter out emails from hosts that don’t have valid A record, edit Postfix main configuration file. Add the following line in smtpd_sender_restrictions. Note that reject_unknown_client_hostname does not require HELO from SMTP client. It will fetch the hostname from PTR record, then check the A record. The MAIL FROM address is also known as envelope from address. Some spammers use a non-existent domain in the MAIL FROM address. If a domain name has no MX record, Postfix will find the A record of the main domain and send email to that host. If the sender domain has neither MX record nor A record, Postfix can’t send email to that domain. So why not reject emails that you can’t reply to? To filter out this kind of spam, edit Postfix main configuration file. Add the following line in smtpd_sender_restrictions. It will reject email if the domain name of the address supplied with the MAIL FROM command has neither MX record nor A record. As required by the SMTP protocol, any legitimate SMTP client must be able to re-send email if delivery fails. (By default, Postfix is configured to resend failed emails many times before it informs the sender that the message could not be delivered.) Many spammers usually just send once and would not retry. Postgrey is a greylisting policy server for Postfix. You can install postgrey on Ubuntu from the default repository. And it listens on TCP port 10023 on localhost (both IPv4 and IPv6). By default, the greylist time is 300 seconds, which means an unknown SMTP client needs to wait 5 minutes before re-sending the email. If that’s very long to you, you can change it to 60 seconds or 120 seconds. This can be configured in /etc/default/postgrey file. Save and close the file. Then restart postgrey for the change to take effect. Next, we need to edit Postfix main configuration file to make it use the greylisting policy server. Add the following line in smtpd_recipient_restrictions. In case you don’t know, the directive check_policy_service unix:private/policyd-spf in the above screenshot will make Postfix check SPF record on the sender’s domain and you are advised to implement SPF and DKIM on your own domain to improve your email sender score. Save and close the file. Then restart Postfix. From now on, Postgrey will reject an email if the sender triplet (sender IP address, sender email address, recipient email address) is new. The following log message in /var/log/mail.log shows a new sender triplet. The action “greylist” means this email message was rejected. From my experience, Chinese email spammers like to use a fake, weird-looking and randomly generated sender address for every email, so adding these fake email addresses to blacklist won’t stop them. On the other hand, they never try re-sending a rejected email with the same sender address, which means greylisting can be very effective at stopping this kind of spam. Greylisting can result in bad experience for the end user, as the user has to wait another several minutes for the email to arrive. To minimize this bad experience, you can create whitelist. Postgrey ships with two whitelist files (/etc/postgrey/whitelist_clients and /etc/postgrey/whitelist_recipients). The former contains a list of hostnames and the latter contains a list of recipient addresses. By default, Google’s mail servers are whitelisted. No matter the sender is using a @gmail.com address or other address, as long as the sender is using Google’s mail server, Postgrey won’t reject the email. The following line in my /var/log/mail.log file shows this. Note: You can also see postgrey logs with this command sudo journalctl -u postgrey. You can get these hostnames with a tool called pflogsumm, which I will discuss later in this article. So I can add the following configurations in /etc/postfix/main.cf file. Some public blacklisting service requires monthly fee. For now, I’m using the free service of spamhaus.org. reject_rhsbl_helo makes Postfix reject email when the client HELO or EHLO hostname is blacklisted. reject_rhsbl_reverse_client: reject the email when the unverified reverse client hostname is blacklisted. Postfix will fetch the client hostname from PTR record. If the hostname is blacklisted, reject the email. reject_rhsbl_sender makes Postfix reject email when the MAIL FROM domain is blacklisted. reject_rbl_client: This is an IP-based blacklist. When the client IP address is backlisted, reject the email. Some spammers use Google’s mail server, so reject_rhsbl_helo is ineffective, but most of them use their own domain names in the MAIL FROM header, so reject_rhsbl_sender will be effective. Sometimes there are legitimate email servers blacklisted. You can create a whitelist so they won’t be blocked. Create the following file. In this file, whitelist domain names like below. Save and close the file. Then run the following command to create the rbl_override.db file. Edit Postfix main configuration file. In smtpd_recipient_restrictions, add the following line. Reload Postfix for the changes to take effect. Here’s a screenshot of my Postfix spam filters. Use the following command to generate a report for today. Generate a report for yesterday. If you like to generate a report for this week. To emit “problem” reports (bounces, defers, warnings, rejects) before “normal” stats, use --problems-first flag. To append the email from address to each listing in the reject report, use --rej-add-from flag. To show the full reason in reject summaries, use --verbose-msg-detail flag. You can add a cron job to make pflogsumm to send a report to your email address every day. Add the following line, which will generate a report every day at 4:00 AM. To receive the report via email, add the following line above all cron jobs. You should pay attention to the message reject detail section, where you can see for what reason those emails are rejected and if there’s any false positives. Greylisting rejections are safe to ignore. If the MAILTO variable has already been set but you want Postfix log summary sent to a different email address, you can put the following line in your Cron job. The output of pflogsumm command is redirected to mutt, a command line mail user agent, which will use the output as the email body and send it to the email address you specify at the end. Of course, you need to install mutt on your Linux server. DMARC (Domain-based Message Authentication, Reporting and Conformance) is an Internet standard that allows domain owners to prevent their domain names from being used by email spoofers. Please check the following guide. Mail servers that forward mail on behalf of anyone towards any destination is called open relay. In the beginning, this is a good thing. As time went by, open relays are abused by spammers and now open relays are often blacklisted. The following line in /etc/postfix/main.cf file prevents your email server from being an open relay. This line tells Postfix to forward email only from clients in trusted networks, from clients that have authenticated with SASL, or to domains that are configured as authorized relay destinations. It should be already in the main configuration file after you install Postfix. After some time, the spammer knew that he cannot get through my spam filter. This bad actor started flooding my email server with SMTP AUTH connections. In my /var/log/mail.log file, I can find the following messages. To stop this kind of flood attack, you can use fail2ban, which is a set of server and client programs to limit brute force authentication attempts. Install fail2ban from default Ubuntu repository. The fail2ban-server program included in fail2ban monitors log files and issues ban/unban command. By default, it would ban a client’s IP address for 10 minutes if the client failed authentication 5 times. The ban is done by adding iptables firewall rules. You can check iptables rules by running the following command. To enable fail2ban on Postifx, add the following lines in /etc/fail2ban/jail.local file. If the file doesn’t exist, then create this file. You can change the bantime to something like 30m or 1h to ban the bad actor for longer time. If you would like to whitelist your own IP address, add the following line to tell fail2ban to ignore your IP address. Replace 12.34.56.78 with your own IP address. Multiple IP addresses are separated by spaces. By default, the allowed max number of failure it 5 times. After 5 failures, the client will be banned. To specify a customized number of failures, add the following line. Change the number to your liking. Save and close the file. Then create the filter rule file. In this file, we specify that if the “lost connection after AUTH from” is found, then ban that IP address. Save and close the file. Restart fail2ban the changes to take effect. In the fail2ban log file (/var/log/fail2ban.log), I can find the message like below, which indicates the IP address 114.223.221.55 has been banned because it failed authentication 5 times. I can also check my iptables. This indicates fail2ban has set up a iptables rule that reject connection from 195.140.231.114.broad.nt.js.dynamic.163data.com.cn, which is a hostname is used by the spammer. If you would like to manually block an IP address, run the following command. 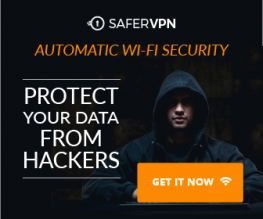 Replace 12.34.56.78 with the IP address you want to block. Really helpful. I currently pay for web hosting and a mail server but my 3 year contract is ending soon and have been researching methods on hosting this on an easy to deploy gcloud micro instance. Thanks for the spam filter information!! For several days I trying to set up and secure mail server. It’s probably okay, but I still have questions. In your “How to Easily Set Up a Full-Featured Mail Server on Ubuntu 18.04 with iRedMail” you wrote: “By default, iRedMail has enabled greylisting”. What is better: default iRedMail greylist or Postgrey? If I install Postgrey, should I disable default iRedMail greylist? lost connection after (AUTH|UNKNOWN|EHLO) from (. *)\[\]"
Is this the same rule or I still should add your [postfix-auth] to my jail.local? And in my jail.local is only one jail [DEFAULT] – is this correct? If you use iRedMail to set up your mail server, I recommend using the default iRedMail greylisting service and the default Fail2ban jails. I would use Postgrey and create my custom Fail2ban jails if I set up mail server from scratch. Excelente post compa gracias por el aporte. so if I follow one of your first four tips, then it will stop sending mails from local network, am I right? These tips are used to block inbound spam from other SMTP servers. Your own users on the local network and localhost can send emails as usual. I assume by “accept” you mean outbound emails are submitted to Postfix from local network and localhost, which is different than accepting inbound emails from other SMTP servers. 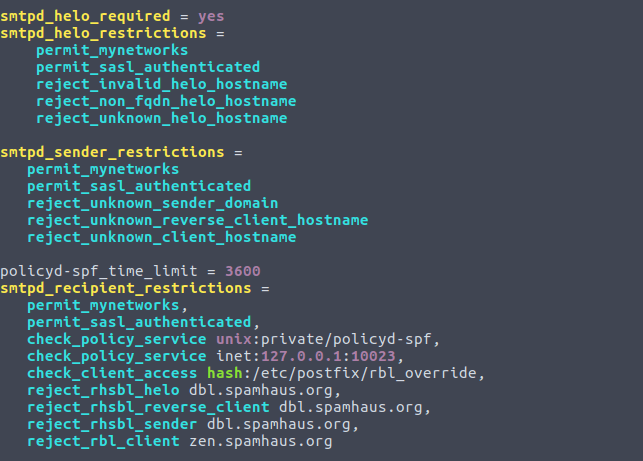 check_policy_service unix:private/policyd-spf – this blocks gmail and other external mailservers, even if maillog show, that gmail is whitelisted. Sorry if I didn’t explain it well. You need to follow this tutorial to implement SPF checking. In practice, SPF is more useful when you combine it with DKIM to enforce DMARC record checking to stop spammers impersonating other person’s domain name. I will write about enforcing DMARC checking in the near future. 10.230.220.56 doesn’t seem to be Google’s IP address. Every IP address owned by Google has a reverse DNS record. That’s true if you receive emails from many different domains.